I add in some kind of extra protein in the form of lunch meat, cheese stick or cubes. Rice pudding is a relatively new thing we’ve been trying. I didn’t love it as a kid myself, but so far so good! It’s a great way to use up leftover rice and fill their little bellies. If it’s not your child’s thing, you can totally substitute yogurt or cottage cheese. This menu is 100% flexible! -My kids will eat the sticks cold or at room temperature, but you can keep them warm if you like in an insulated bowl. -I send jam because maple syrup is more likely to leak. My daughter also likes a little spoonful of jam in her rice pudding, so it pulls double duty for this menu. -Swap out the salami for ham or another lunch meat. -If rice pudding isn’t a popular item, switch it out for yogurt or cottage cheese. 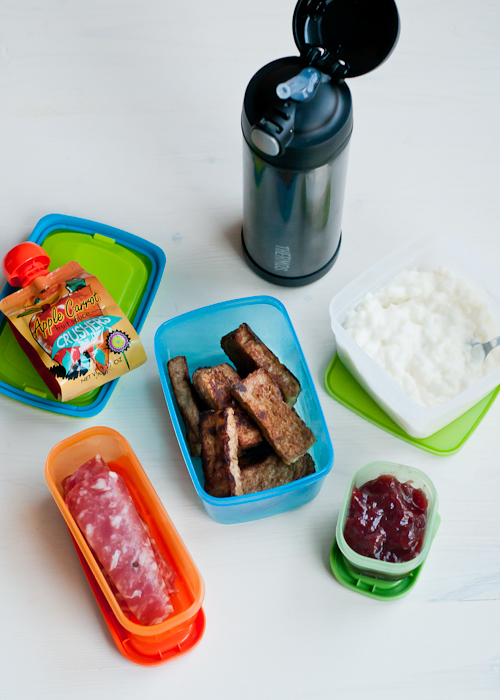 -Don’t forget the ice pack (or insulated containers if you go that route) with this lunch. P.S. — You can see all of the lunchbox menus in the series here. It’s so easy to get consumed by life-especially during the holiday season. I’ve been bookmarking your email updates (glad I subscribed) and today’s post REMINDED me what I wanted to do after reading your initial “call to donate” to Children’s Miracle Network hospitals — so today, instead of writing a reminder or putting it off– I donated and I feel great and thank you for doing what you do!!! I love this lunch! My kids adore rice pudding, but I’d never considered sending it in their lunch box. Thanks for this series! Every post has given me new ideas and helped me re-think what I’m sending from home.